Even in the 110 F. heat, Kamal* works daily as part of a construction crew, building a several-story-high building in our residential neighborhood of the city of Suleimani. He stopped a moment, in the hot sun, to pose for my photo, not minding the short break from his work. 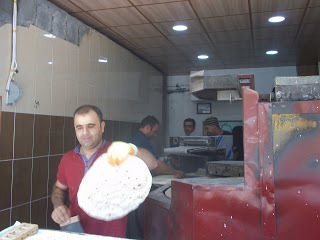 Every day, early morning until late in the evening, Shorsh* and a crew of three other men slap out dough into large thin discs, bake them, and lay them out on an open table. Eight large rounds of bread cost a little less than a U.S. dollar. People, of all ages, mill around his shop, buying fresh bread for their families. Clothing store in Sulaymaniyah, Kurdistan. Photo by: Peggy Gish. A few doors away, a clothing shop opens only in the evenings, when there is some relief from the intense heat and more people amble along the street to shop. A few will also stop at the ice cream shop next door. Others will visit a grocery shop where Rebaz,* his wife, or any of their three older children, greet me and other customers with a smile and help us find what we need. Life is more secure and stable in the Kurdish region, compared to other areas of Iraq. Yet even here, the daily life for the average Iraqi Kurd is challenged by general social and economic difficulties, poverty, and the needs of displaced persons coming in from other areas of the country. Even public school teachers and lower level government workers have been hit economically. Most of them, except for the Peshmerga, (Kurdish military forces), have in the past year, received just a fraction or their salaries, or none at all, for months at a time. In an economy weakened by massive corruption and supported by oil revenues, the drop in global oil prices has certainly had an effect on government ability to pay their workers. But it is more than that. Because the Kurdish region has been selling and keeping the profits from their own oil sales on the international market, the Iraqi Central government in Baghdad no longer gives the Kurdistan Regional Government their previous allotment of 17% of Iraq’s oil revenues. People here are keenly aware of the fighting going on with ISIS (locally called, “Daesh”) at the southern borders of their Kurdish region, and have not dismissed the possibility of the violence coming into their communities. The closest unit of Daesh forces to Suleimani is a two hour drive away, in an area just south of Kirkuk. Many families have members who are on active duty with the Peshmerga, maintaining the protective border from Daesh that extends more than 200 miles across northern Iraq—from the city of Sinjar, near the Syrian border, to the edges of the city of Kirkuk.